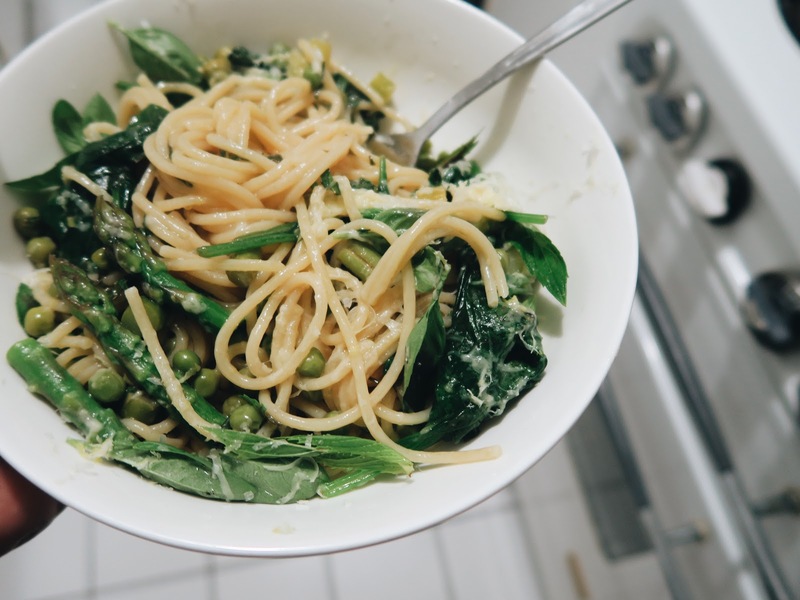 salt sugar and i: Anna Jones's one-pan pea, lemon & asparagus pasta. And before all our warm days are over and the summer produce really does disappear I needed to share a recipe with you. It's pasta and I bloody love it. It's a one pan recipe so it'll be the easiest washing up you'll do all week, it's pasta so we're winning already and it's full of fresh herbs and lemon zest which are a great combination together. If you are reading this and think I've gone mad (which could be the case) and asparagus season has already left us (which could be the case) the vegetables are interchangeable in the recipe, just keep the pasta and water ratios the same and replace the asparagus with a vegetable of your choice with a similar cooking time or stick with frozen baby peas. It's a recipe that will impress... you cook the pasta and sauce in the same pan? Whaaaaattt!? Yep. I've made a one pan pasta dish and blogged about it before but for this one is a little more special, the flavours are summer in a pasta and I couldn't keep it to myself. We're off beach camping this long weekend and I can't wait. Campfire cooking, digestive biscuit smores and sandy feet, oh and a good book (I'm nerding out on this one at the moment). Hopefully I'll have a campfire story or dinner to share. Until then, enjoy whats left of the warm days, the Easter long weekend, asparagus and make some pasta. You'll thank me. Recipe ever-so-slightly adapted from The Modern Cooks Year by Anna Jones. To start with, fill and boil a kettle and get all your ingredients and equipment together. Put the pasta into a medium sized pan. Snap the woody bottoms off the asparagus and chop the stalks into ½cm rounds, leaving the tips intact. 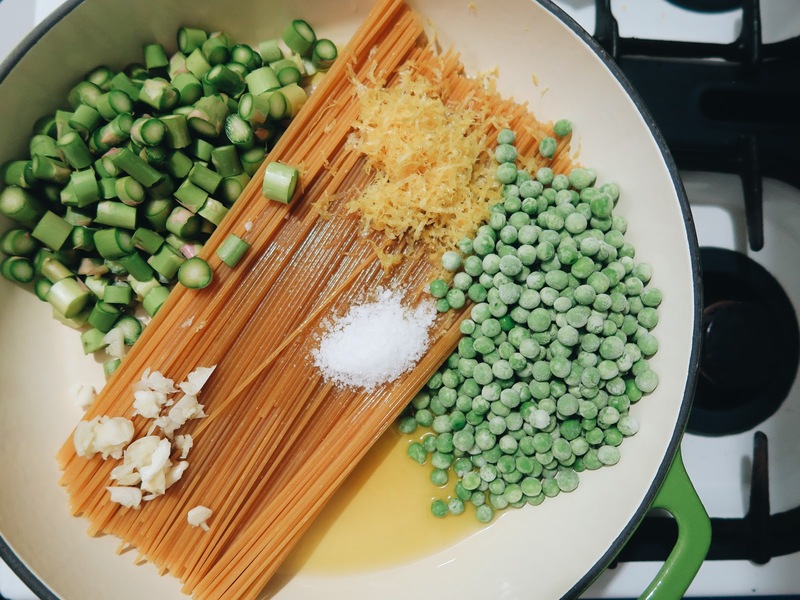 Put the tips to one side and throw the rounds into the pan with the pasta along with the sliced garlic, peas, olive oil and salt. Grate in the zest of both lemons and add it to the pan with 1 litre of boiling water. Put a lid on the pan and bring to the boil. As soon as it comes to the boil, remove the lid and simmer on a high heat for 8 minutes, using a pair of tongs to turn the pasta every 30 seconds or so as it cooks. After the pasta has had 8 minutes, take the lid off and stir through the asparagus tips and the baby spinach and tear in the herbs. Simmer for a final 2 minutes. Once almost all the water has evaporated, take the pan off the heat and leave to sit for a minute or two, this is so the pasta can absorb most of the remaining water and form a lemony sauce. 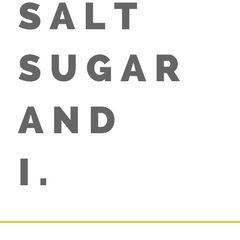 Taste to see if you need to add more salt, freshly cracked pepper or lemon juice. Tangle into four bowls and top with grated parmesan. Asparagus season has started in California and your pasta looks great . I have to try it.